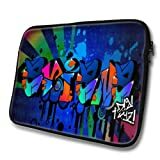 “Graffiti Names” designed for Aviana, Designer 15”- 39x32cm, Black Waterproof Neoprene Zipped Laptop Sleeve / Case / Pouch. High quality double sided design. Soft 3 mm thick neoprene water resistant material protects your laptop from scratches, dust and fall outs. Dimensions: 390 mm x 320 mm x 15 mm. One compartment sleeve with a secure zip fastening. Other designs available in our shop. Solid protective sleeve is designed for the 15”- 39x32cm Laptops. Feel safe carrying your laptop with this Sleeve Case. Soft Neoprene Water Resistant material with Anti-Shock System protects your device from scratches, bumps and dust. 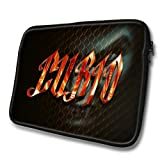 “Graffiti Names” designed for Aviana, Designer 14” – 39x31cm, Black Waterproof Neoprene Zipped Laptop Sleeve / Case / Pouch. Dimensions: 390 mm x 310 mm x 15 mm. One compartment sleeve with a secure zip fastening. Solid protective sleeve is designed for the 14” – 39x31cm Laptops. Feel safe carrying your laptop with this Sleeve Case. Soft Neoprene Water Resistant material with Anti-Shock System protects your device from scratches, bumps and dust. 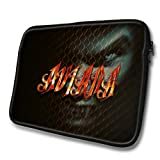 “Stigma Names” designed for Aviana, Designer 14” – 39x31cm, Black Waterproof Neoprene Zipped Laptop Sleeve / Case / Pouch. “Stigma Names” designed for Curio, Designer 14” – 39x31cm, Black Waterproof Neoprene Zipped Laptop Sleeve / Case / Pouch.